Everything's going to be really confusing in 2022. There'll be no virtually no more crime or unemployment under a vague-sounding government established by someone called the New Founding Fathers, but everyone's still going to be unhappy, carrying around massive amounts of rage and stockpiling personal arsenals of assault weapons and machetes, which they will use freely on one another for one night each year in something called the Purge. A robotic acquiescence will accompany this scenario, made up of equal parts Stepford vacancy, wide-eyed religious mania and extreme self-control for the rest of the calendar's 364 nights. But then it's murderin' time! For 12 hours the entire country will reenact The Strangers, Night of the Living Dead, Funny Games and the Tate-LaBianca murders. The next day you'll get up and go back to work like nothing happened and somebody -- nobody knows who -- will sandblast all the blood and dismembered bodies from your driveway. 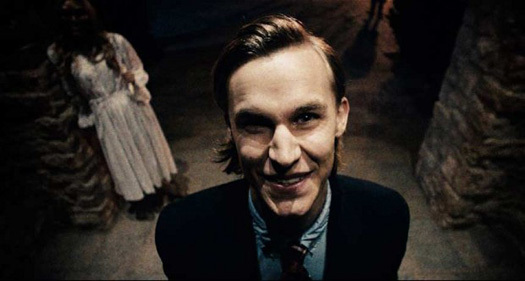 If you're looking for more explanation than that don't ask the movie for it, because once The Purge sets up its extreme-violence-as-spiritual-catharsis premise it ignores all deeper inquiry for the remainder of its lean, mean 85 minutes. The Sandin Family (Ethan Hawke, Lena Headey, Adelaide Kane, Max Burkholder) begin the night in their McMansion, barricaded behind an expensive security system, but when a terrified homeless man (Edwin Hodge) shows up, begging to be let in, compassion trumps safety. The mob of young, prep school-uniformed miscreants ("We're entitled to purge!" yells their leader) who are chasing him for sport then turn their attentions to destroying everyone inside, the setup for an unexpectedly ax-murdery, blunt-headed Edward Albee play. Every so often the movie remembers its scenario's equally dark and undeveloped subplot of social engineering -- the systematic elimination of the poor via annual killing sprees, the arming of all American citizens -- but then just as quickly forgets its fake concern because there's too much awesome stalking, stabbing and shrieking demanding camera time, too many luxury objects that cry out to be righteously smashed by bad-guy skulls. It's a schlocky death trip, one with just enough fear, tension and minor-league surprise to keep its genre head held upright, but not enough to really aspire to anything more than bringing the hurt. This is bad news for depth and subtlety and whatever other high-minded sub-concerns the movie thought it had in the planning stages, but it's great news for violence-hungry audiences hoping to see Lena Headey take care of business all Game of Thrones style. Meanwhile, the mysterious macro-level ideas of the premise, made micro here, are already bucking for a more expansive sequel where grand scale mayhem rules the day and nagging questions can finally be answered about this freaky new government and, more excitingly, all those practical considerations. Stuff like overloaded hospitals, funeral homes with waiting lists, overtime pay scales for crime scene clean-up crews, and The Call's Halle Berry pulling a double shift and still having to work straight through her lunch on that 911 switchboard. Nobody will ask about social commentary at that point, it'll be straight blood circus all the way.